U.S. Jewish leaders pressed Palestinian Authority Prime Minister Salam Fayyad on incitement last week and the need to keep Israel a Jewish state. At a meeting Feb. 18 in Jenin between Fayyad and a visiting delegation from the Conference of Presidents of Major American Jewish Organizations, Alan Solow, the chairman of the Jewish umbrella group, said the actions of the Palestinian leadership set back the cause of peace. Fayyad criticized Israeli military incursions into Palestinian areas, saying they undermined the Palestinian leadership. 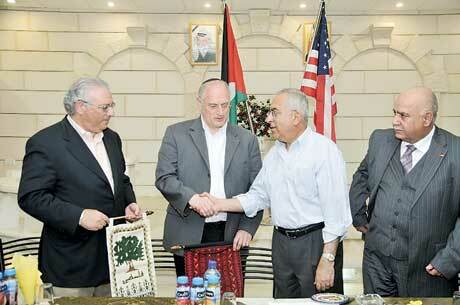 He pledged that the Palestinian Authority is committed to nonviolence and coexistence. The PA wants “a progressive state, democratic, which doesn’t tolerate discrimination, which is open, culturally sensitive – including to our Israeli neighbors,” Fayyad said, according to The Jerusalem Post. ZOA President Morton Klein, who was present for the Feb. 18 meeting, also raised the issue of incitement at a meeting with several journalists covering the Middle East conflict, including New York Times bureau chief Ethan Bronner. Klein complained that the Times all but ignores incitement in the official Palestinian media and the perceived endorsement by the Palestinian leadership of anti-Israel terrorism, while reporting extensively on allegations against Israel. According to Klein, Bronner explained the difference by pointing to different expectations of Israelis and Palestinians. Bronner told JTA that wasn’t exactly what he had said and declined to comment further.